EASY Cloud Archive provides a powerful solution for document archiving in the cloud. It allows you to save tax-related data and documents subject to retention easily, digitally, and safely in the cloud. The core of the application is the tried-and-tested and successful archive solution from EASY SOFTWARE. 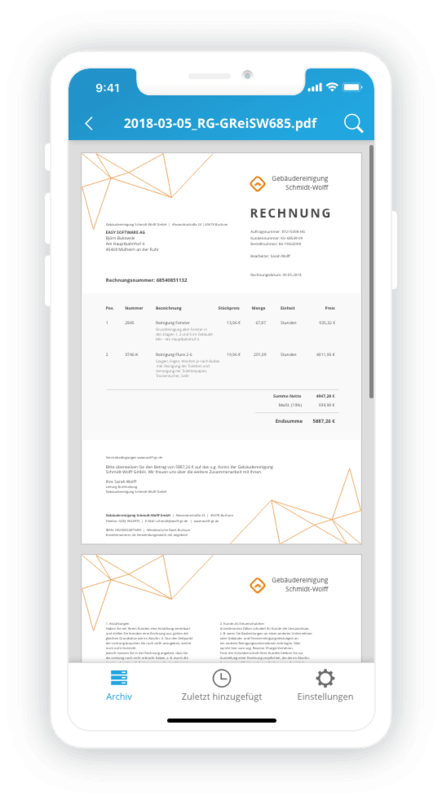 You can say good-bye to paper storage: EASY Cloud Archive creates a digital archive for you – to store all your invoices and documents in. The cloud archiving system automatically transfers your digital documents – more than ever, you’ll meet your documentation requirements the easy and less time-consuming way. You can access your archived documents anytime, anywhere, with each document being quickly found: either using direct search in the intuitive Web client or, in the Smartphone APP, using the search for properties or full text search. 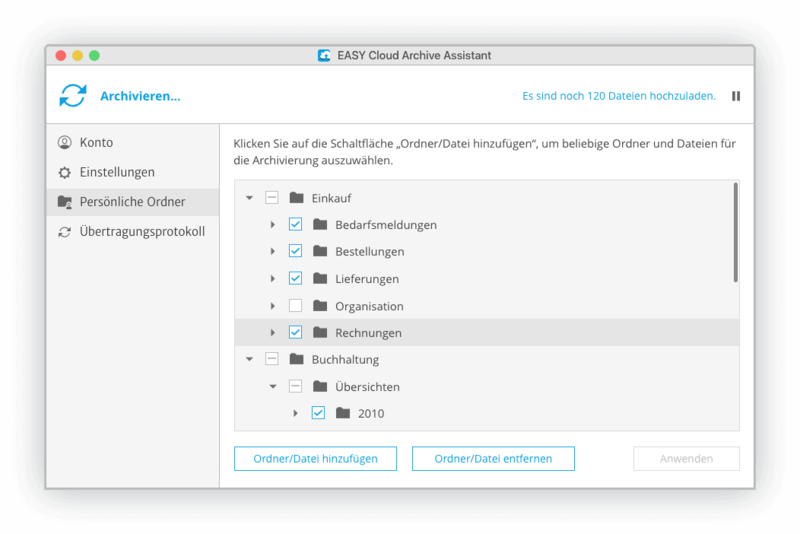 EASY Cloud Archive is preconfigured and directly ready to use. What’s particularly useful is that the EASY Archive wizard performs the storage for you. All you do is define the data sources and folders on your systems from which the wizard automatically uploads files. The wizard even automatically stores posting-related files in the EASY cloud. A Web client or the mobile app then allow you and all valid users to safely access the data archived in the cloud at any time. EASY Cloud Archive lets you archive in a compliant manner and in compliance with Principles for properly maintaining and storing books, records and documents in electronic form and for data access (GoBD). The solution is certified; it guarantees, among others, thanks to auto-versioning, immutability of files that have once been archived. The original file always remains forgery-proof. To prove revision security, a protected activities log keeps all transmissions, changes, and deletions. Even accidental deletion of files is precluded: this is ensured by a double-checking mechanism. Data security and protection from data loss are a priority with EASY Cloud Archive. 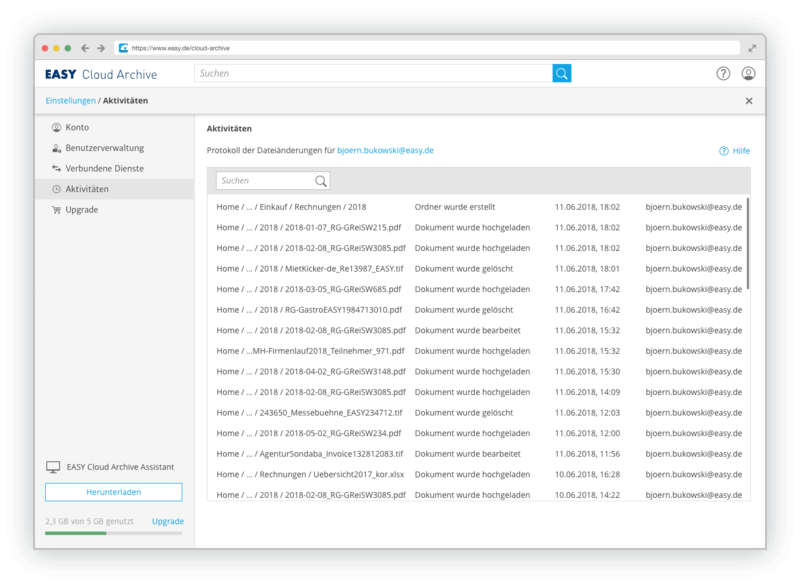 Cloud archiving itself, as well as all transmission paths are effectively protected against unauthorized access, because EASY Cloud Archive uses high-availability servers in high security datacenters and an effective, AES 256-encrypted HTTPS connection. Documents are saved based on the Data Protection Act. The Web client is easy to use. All permissions – from users to administrators – are set up in the shortest possible time. For documents and folders, collaboration tools such as remarks, notes, and much more are available. Already when transferring documents to the document archive in the cloud, powerful OCR software reads the content. Right from the start, you can search for all terms in a document using full text search. This ensures that each file is instantly found. Shortly after initial setup, all authorized team members can already access the invoices and documents saved in EASY Cloud Archive, share documents, and edit them together. 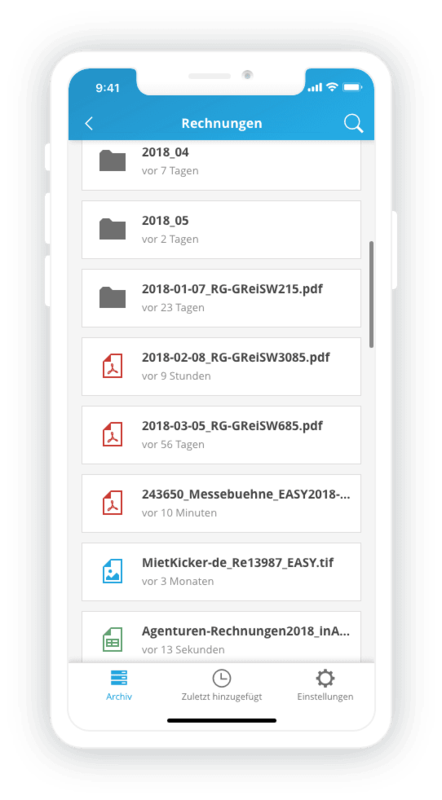 Even mobile – because EASY Cloud Archive not only works on desktops, it also works as an app on iOS devices. Revision-proof archiving according to correctness, integrity, security, protection from loss, traceability, etc.